The first phone call to Samaritans was made on 2 November 1953. To mark this momentous day 60 years on, we are very proud to announce that BT have kindly agreed to have the BT Tower in central London carry our birthday message for the day! It will host 'Happy Birthday Samaritans!' for the 24 hours of our birthday, so please do tweet us and post on facebook if you see it and attach a pic! In addition the BT phone box outside St Stephen's Walbrook, where our founder first started Samaritans, will be painted green, and 20 BT phone boxes around the country will be advertising the Samaritans service. A BIG thank you to BT for generously supporting our 60th birthday events. Celebrations are taking place around the country to mark our 60th birthday, so watch this space for more details! Our 60th birthday celebrations kicked off earlier this year when our patron HRH Prince Charles hosted a birthday reception for us at Clarence House, attended by many of supporters including Stephen Fry and Joanna Lumley - watch their video interviews. 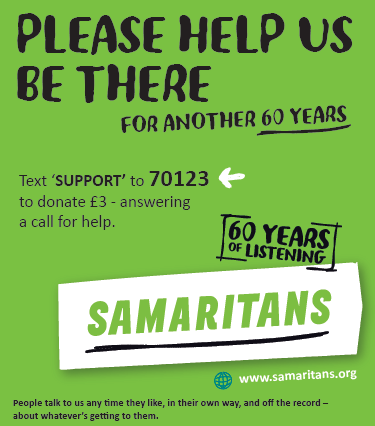 To mark Samaritans’ diamond year, the charity is asking people to help them be there for the next 60 years. Please text ‘SUPPORT’ to 70123 (terms) to make a £3 donation.